After the inauguration of T1 terminal at El Prat airport, the activity of the old terminal has been reduced basically to low cost companies and airlines that are not members of any alliance. Thus, most of the passengers arriving to Barcelona by air see the modern, white, photogenic new terminal, but they will not be able to enjoy a piece of art that has been greeting us for ages when we came home: the Miró mural. 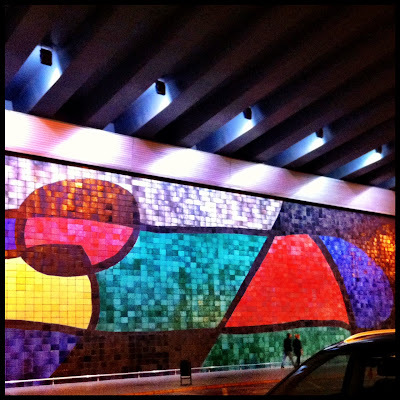 In 1968 one of our world-renowned artists decided to devote and donate four works to the city where he was born: the sculpture "Woman and Bird", at the Parc de l'Escorxador, the mosaic at Pla de l'Os on the Rambla, the Miró Foundation and this ceramic mural, that was installed on the facade of what today is the T2 terminal building. Miró mural has always been associated to something special: a welcome, a farewell, a trip, a gathering, a homecoming...if the wall could talk, it would certainly explain thousands of stories of all kinds! Those who, as I did, started driving in the 90s can not imagine Barcelona without the Rondes, the ringway that goes around the city. These two ring roads were built, like so many other things, for the 1992 Olympic Games. They are over 35 kilometers long and the two big junctions at both ends help distribute the traffic moving through Barcelona and its metropolitan area. As a regular user of the Ronda del Litoral I know perfectly its limitations. I know they have been criticized for the number of accidents in it and because they don't contribute to promote sustainable transport. I also know that there are many miles without a shoulder, that entrance ramps are often short and dangerous and traffic jams are very common in some sections. By the way, those traffic jams can be really exasperating when there a vehicle breaks down and stops occupying a whole lane. I do not even want to imagine the city traffic if all this amount of vehicles that circulate now along the Rondes had to drive through the center of Barcelona! When the Bicing service system opened in 2007 I hurried up to sign up. By that time, my bike had been stolen several times on the streets of the city, so I really thought it was the best idea that the municipality could have in order to promote healthy, clean and non-expensive transportation. The Bicing was close to collapse shortly after it opened, when the many bikes were broken and not all anchors seemed to work properly, but I have always been a regular user. It has only (or already, depending on your perspective) been six years and I can't deny that the Bicing has become an image of Barcelona. Leaving aside complaints from pedestrians because of the incivility of some cyclists and complaints of Bicing users about the lack of good bike paths, one must admit that the public bike system has become a "thing of Barcelona", as those that I try to highlight in this blog. Have you ever been to the circus in Barcelona? I have, but just to one of those big and "modern" circuses focused more to attract adult audiences. The truth is that I would have liked to go to a circus as a child, one of those traditional ones, those who assemble and remove their tents in the few open spaces left in the city. Those circus in which artists arrive in trucks and vans, the ones that exercise a fascination among those of us who do not live on the road, the ones that make us wonder what it is like to live in a special community, a nomadic family. The truth is that circuses have changed a lot since I was little. Luckily, they still visit us. For the record, I like that they are adapting to changing times. And by the way, there is a circus school working in the Parc del Forum. It is called La Central del Circ, and is meant to be a space for developing circus activities that the City Council prompted, and where training courses are held, in case if anyone is thinking about it! I often say that this blog not only talks about the things I like from Barcelona, but also those other things that may seem ugly, uncomfortable or even disgusting. And a good example of something really Barcelonian and really ugly are the added floors that have been built on many buildings of the Eixample. I know we have not been particularly careful to Cerdà's plan as it was conceived, and that for a time many people tried to take full advantage of a ground that was considered wasted. So, taking advantage of the improving building techniques and of their cheaper costs, and with the necessary collaboration of political powers, many homeowners and builders decided to gain two, three, four and even five floors, as the building showed on the picture above. It is virtually impossible to restore the building as it was originally, because the people living on this floors do it in a completely legal way, so we must get used to the added floors. If at least they were made with good taste! It had been a while since I had last been around the market of Fira de Bellcaire, also known as the Encants Vells market, and I have to admit I was surprised by its vitality, especially considering it was a weekday morning. The market was full of visitors, buyers, onlookers and vendors. I have to say, though, that the idea I had in my mind was slightly more romantic than what I found there. Anyway, the point is that the market of Encants Vells is still as alive as ever, and the idea is to continue this way when the new Encants Nous is open during this year. This new market will have doubled the area of ​​the fair and will facilitate the access to traders and visitors, and the loading and unloading of goods. Anyway, the Fira de Bellcaire, which is held since the fourteenth century, is one of the oldest markets in Europe, so there are few things that can be considered more "Barcelonian". 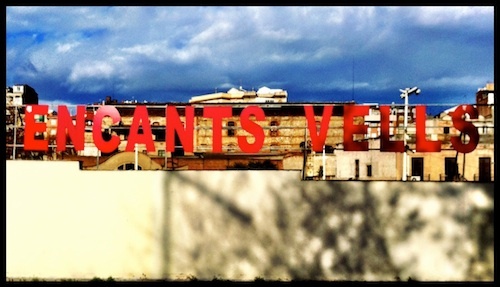 And by the way...who does not have or had any object from Encants Vells? I remember I bught a foam mattress a few years ago, and for the record, I still have it. I do not intend to change it: when I have guests who sleep at home on it they tell me that it is extremely comfortable! Acording to what I have heard, the ideal city for skateboarders would be one with good weather and long hours of sunshine, compact, with a some slope and many items of urban furniture. Does this description sound familiar? In this great city for the skaters, the perfect square would be quite broad, in order to move freely in it, but also with slopes, stairs, railings, curbs and benches. Oh, and if it is possible, also with a prominent architectural element to make good pictures! Clearly, the skaters dreams have come true in the Plaça dels Angels of Barcelona, which is located next to the MACBA (Museu d'Art Contemporani - Contemporary Art Museum), to the point that it has become a meeting point and a world reference for skating enthusiasts. Besides the coexistence problems that may have arisen due to the presence of the skaters, they have clearly transformed the square into a unique one, different from the rest, with its own character. And that's the point, right? Some days ago I was walking along the Besòs river Park, a restored space of nature and leisure, at the mouth of the river. When you walk through that area you can't avoid noticing the presence of the power station, with its three tall smokestacks. Although the station is not in the municipality of Barcelona, it is clear that its uniqueness and visual power are a milestone in the northern coastal landscape of the city, from the moment it was built in the 70s. Three smokestacks 200 meters high don't go easily unnoticed. The plant has been controversial since its inception as it is still today, although it is under partial demolition. Its construction generated many protests, which actually caused one death. During the decades of operation, the plant generated black rains in the municipalities of Sant Adrià and Badalona, that made cars and clothes dirty. In 2008, when its closure was approved, people from Sant Adrià decided in a referendum to keep the three chimneys of the plant as a symbol of identity of the city, although participation in the vote was very low. Theoretically the plant must be used to host a public facility, but its future is very uncertain right now, partly due to lack of funding, and there are many voices saying that the smokestacks should be demolished and the landscape restored as natural as possible. What do you think about it? One of the most visited post of the (short) History of this blog is the one about Ulysses the Orca, that I wrote and published about a year ago. The visits to the Catalan and Spanish version of this post has almost three times the ones to the next one, about the chocolate of Petritxol street, in second place. Ulysses the orca has probably been the second most famous resident of the Barcelona Zoo, in dispute with the elephant may Avi, the first one to come to our zoo. They both are defeated, and I think there's no doubt about it, by our white gorilla, Snowflake. I remember seeing Snowflake on several occasions when I was a kid, and I must say that I loved him but he was not specially friendly. I always attributed this to the fact that he knew he was special, and that many of us visited the zoo just see him, so he was aware he was quite famous. Perhaps it was just my imagination. Sometimes, we are so used to something that we take it for granted. In Barcelona that happens often. We walk without paying attention next to architectural wonders, as if they were the most common thing. Although the intention of this blog is not to list the main attractions of Barcelona, that does not mean that sometimes I have to stop at buildings that leave astonished to both tourists and barcelonians. And if they are celebrating an special date, like La Pedrera, which celebrates its centenary. The Casa Milà is one of the most famous modernist buildings of the architect Antoni Gaudi, who designed it when he was in his artistic summit, and where he showed without any complex his admiration for the organic shapes of nature, in addition to applying innovative structural solutions. Did you know that the point where this building was built was the exact boundary between Barcelona and Vila de Gràcia on Passeig de Gracia, the main axis of the new bourgeoisie of the time? Did you know that the people of Barcelona named it La Pedrera (quarry in Catalan) due to its appearance? Did you know that it is a World Heritage Site since 1984? I have mentioned a couple of times on this blog the fact that the pastry counters in Barcelona change depending on the season of the year, and there are some sweets that have "starring" appearances during only a few days, as the "coca de Sant Joan" or the Easter Cake. In case anyone wants to try to do panellets, it is never a bad moment, and HERE you have a recipe. If you try it and make some, please let me know...I love them and I haven't had any yet! When I was a kid, I had a friend whose family was really keen on football. Sometimes, problems arose because his father was a big fan of Espanyol, while the mother was an inveterate "culer". Moreover, at that time it wasn't very usual for the women to be football fanatics, so the situation was curious. The point is that, sometimes, my friend's father took us to see the Espanyol match at the Sarrià Stadium. I was not really very interested in football, but I recall having a good time everytime I went there. I had no idea that the Stadium was set in a place with a long history: it was opened in 1923, on the road leading to the village of Sarrià, which was later annexed to the city of Barcelona. Its cost was over 170,000 pesetas, and the Sarrià was the place where the first goal in the history of the league was scored. In the 1982 World Cup Sarrià received the powerful selections of Italy, Argentina and Brazil. Now, every time I walk around that area I can not help thinking of those football games I saw there. At the Sarrià Stadium. Some connections between lines in the Barcelona Metro network are virtually instantaneous, some others are quite short, some are long, and then we have, in a category of its own, the one in Passeig de Gràcia. I do not know what you do, but I avoid it whenever I can. I prefer not to walk the equivalent of three blocks of the Eixample on a narrow tunnel..
Perhaps you don't know that the tunnel where we walk nowadays to connect between lines takes up part of an underground car park, which is actually behind just a wall of separation. Specifically, we walk along its second basement. If we could get through the car park, the connection would be a little shorter, but the parking was inaugurated in 1967, before the construction of L4, and the best solution they found was going along ots edge. In order to reduce the distance the existing underground halls would have to be modified, and some new entrances would have to be done, in addition to a new corridor, that would go below the parking lot. Due to its cost you can imagine that this project is waiting for better times. I think we'll still have a long connection distance for a few years. "Hello, good morning", "Hi", "Looks like it's hot again! ", "Goodbye, and have a good day". I have never lived in a building with a doorman, but I was imagining what it's like to have one. I guess it must be something you get used to and then you miss when you stop having it. It must be nice to get to the hall of your house and find a familiar face that greets you at that special moment when you leave the private sphere and go to the street, or vice versa. Many will say, and they are probably right, that doormen and porters are known to be very nosy and gossip, but... I guess it's perfectly normal to know the lives of all residents of the building! They see them come and go, they know with whom and at what time, what they carry in their hands and if they arrive by taxi or bus, and even the mail they receive. And we must admit that some of the porter's lodges of Barcelona, many of which are in the buildings of the Eixample, are magnificent. They make you want to stay a while there to watch how people come and go!